On her first full day of campaigning as a declared presidential candidate, Democratic Sen. Elizabeth Warren (Mass.) mused that President Donald Trump might be in jail by the time Election Day arrives. "By the time we get to 2020, Donald Trump may not even be President," Warren reportedly told voters in Iowa. "In fact, he may not even be a free person." 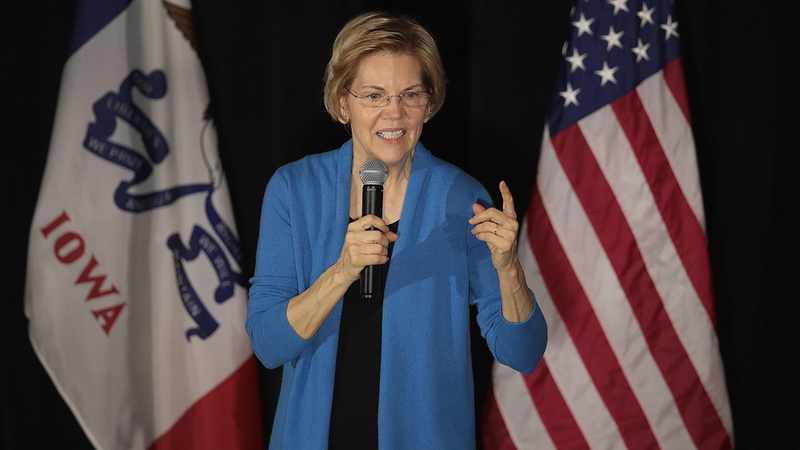 On a previous appearance in Iowa, Warren did not mention the scandals surrounding Trump, which could be used to attempt to thwart his re-election. "But her campaign, which has faced more direct attacks from Trump than other Democratic candidates, appears to see the question about Trump's own viability as way to stop engaging with everything he says," the Washington Post reported. Warren said she believes the country is facing "dangerous moment," according to CNN. "What happens in 2020 is going to determine the direction of our nation, the direction of our people." "Every day, there's a racist tweet, a hateful tweet, something really dark and ugly," the Massachusetts senator also said. "And what are we, as candidates, as activists, the press, going to do about it? Are we going to let him use those to divide us?" Warren launched her own controversy by claiming she's Native American. She recently apologized to the Cherokee Nation for a DNA test that revealed she has just a tiny percentage of Native American heritage. Then, the Washington Post learned that Warren hand-wrote "American Indian" as her "race," on a State Bar of Texas registration card from 1986. Warren now says her campaign strategy is to not focus on everything Trump does or says. "Here's how I see it: Donald Trump is not the only problem we've got," she reportedly said. "Yeah. Donald Trump is the symptom of a badly broken system. So, our job as we start rolling into the next election is not just to respond on a daily basis. It's to talk about what we understand is broken in this country, talk about what needs to be done to change it and talk about how we're going to do that, because that is not only how we win, it's how we make the change we need to make." Warren has decided to ignore what she called Trump's "every day efforts to divide and distract," a campaign spokesperson told CNN. Warren announced her campaign in Massachusetts on Saturday. She joins a growing number of Democratic Party presidential hopefuls who are vying for the party's nomination and a shot at trying to unseat Trump.